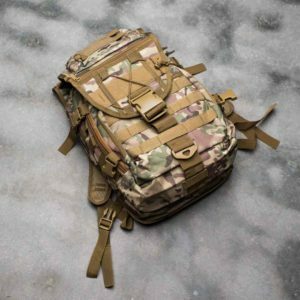 Tactical Backpack for suitable for hunting, fishing, hiking, etc. 3 pocket design with large back pocket, medium size mid pocket, and small front pocket. Available in Woodland Camo, Black, Tan, Green. 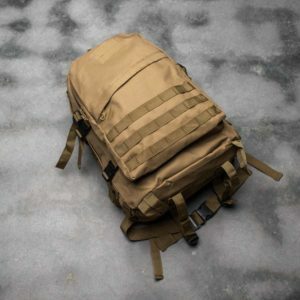 Durable tactical style backpack. 6 pockets plus interior pouches to hold plenty of gear. Comfortable fit. Sturdy front clasp and foldover front flap for added gear protection and quick access to small essentials. Approximately 17″ tall and 12″ wide. Average backpack size. Fits a 15″ screen laptop.